We’d love your help. Let us know what’s wrong with this preview of The Crucifixion of the Warrior God by Gregory A. Boyd. To ask other readers questions about The Crucifixion of the Warrior God, please sign up. Greg Boyd’s two-volume study on the problem of violence attributed to God vis à vis the pacifist teachings of Jesus is most likely the most ambitious available. (At least I hope so!) For many readers, the study will be too long and too detailed. I found it so many times, but that is mostly because he covered ground I was familiar with. Other readers would have needed to see that ground covered. Boyd seeks to argue for a strictly consistent cruciform hermeneutic. St. Augustine and Martin Luther (a Greg Boyd’s two-volume study on the problem of violence attributed to God vis à vis the pacifist teachings of Jesus is most likely the most ambitious available. (At least I hope so!) For many readers, the study will be too long and too detailed. I found it so many times, but that is mostly because he covered ground I was familiar with. Other readers would have needed to see that ground covered. Boyd seeks to argue for a strictly consistent cruciform hermeneutic. St. Augustine and Martin Luther (among many others) argued that the crucifixion and resurrection of Christ was the touchstone for interpreting all of scripture, but they still ended up accepting the violence attributed to God in the Old Testament while earlier Patristic writers posited alternate interpretations to avoid such attributions. Boyd points out a correlation between the Constantinian Revolution in the Church and the tendency of theologians to accept violent portrayals of God. After all, politics is politics. The early Patristic way of absolving God of violence was to argue that Old Testament texts that seemed to ascribe violence to God really meant something else. The usual method of the time was to interpret such passages symbolically. Boyd discusses Origen at great length as the most prominent and formative of scripture interpreters in the Christian centuries. The basic argument was that anything inconsistent with Jesus’ absorbing violence on the cross rather than committing it had to have a meaning under the surface consistent with the Cross. For example, exterminating the Canaanites is symbolic of the need to exterminate the sinful impulses within each one of us. Boyd affirms the basic principle of seeking a cruciform hermeneutic but he suggests that this symbolic approach is not persuasive in our time. The rest of the first volume is devoted to evaluating various attempts to deal with the violence in Old Testament texts and showing where he finds them wanting. All of this is important and valuable, but for the purpose of this review, I will focus on the new approach to a cruciform hermeneutic that Boyd offers under four categories. 1) Cruciform Accommodation. Boyd suggests that in cultivating the chosen people, the Jews, God had to act like a missionary, tolerating many evils in the culture because the people are simply not able to learn the whole truth at once. Boyd uses the image of “masks” where God “pretends” to be violent when God is really non-violent because violence is the only thing the people understand. This category suggests God purposely disguising Godself, but occasionally Boyd lets on that there is a problem of hearing God rightly. That is, people “hear” God commanding violence when God is commanding something else. For example, God really told the people to occupy Canaan, not exterminate everybody. This category works reasonably well in the second sense, but not the first sense. 2) The Principle of Redemptive Withdrawal. This is the main lynchpin of Boyd’s cruciform hermeneutic. When people disobey God and act violently, God allows people to suffer the consequences of their own violence. That is, God protected the Jews from the Assyrians for many years, but once the social injustice reached an intolerable level, God stopped protecting Israel from Assyrian and Assyria destroyed the northern kingdom. Same thing with Babylon and Jerusalem later on. There is a huge amount of support for this notion throughout scripture for this and it is an important principle. The weakness I see in Boyd’s presentation is that it implies that people who are overrun by violent countries like Assyria deserved it because of their sins. For that matter, Assyria and then Babylon suffered the same fates they imposed on Israel and Judah and many other kingdoms. But not always. In Judges 18, the Danites search for a new territory. Their “valiant” scouts come to Laish The five men went on, and when they came to Laish where “ they observed the people who were there living securely, after the manner of the Sidonians, quiet and unsuspecting, lacking nothing on earth, and possessing wealth.” (Judg. 18: 7) God withdrew protection from Laish and the Danites destroyed them, although the narrative gives us any reason to believe they deserved it. In Psalm 44, the worshipers complain: All this has come upon us, yet we have not forgotten you, or been false to your covenant. Our heart has not turned back, nor have our steps departed from your way, yet you have broken us in the haunt of jackals, and covered us with deep darkness.” (Ps. 44: 17-19) The people may have been wrong but should be credited with having really tried to figure out what they had done wrong to deserve their fate and couldn’t do it. This second category is important and explains much, but not enough. 3) The Principle of Cosmic Conflict. This can be a problem for many readers as Boyd argues that the supernatural powers are real and that they inflict havoc on humans. Girard’s analysis of human violence through mimetic desire goes a long way in accounting for the sense of eviol’s transcendence without need actual demons, but I’m not interested in trying to refute Boyd’s understanding here. If supernatural powers are real, they only extend the same field of mimetic conflict analyzed by Girard. That is, Satan engages in mimetic rivalry with God and tries to draw humanity into the same conflict. It is fundamentally the same story as humans rebelling against God and trying to draw other humans into that same rebellion. More to the point: Boyd argues that God protects humans from cosmic forces until their violence becomes so inveterate that God withdraws protection from these forces. Which leaves us with the same pluses and minuses of principle 3. 4) The Principle of Semi-autonomous Power. This idea seems at first the most bizarre, based on a magical view of reality from times of early humanity. This includes the power imbued by God into Moses’ staff and the ark of the covenant. Once the power is there, it can be used rightly and wrongly and God “can” no longer stop that power. Hence the damage of the plagues of Egypt, for example. If we translate this principle to the powers that human have to do good and to inflict horror, this principle becomes the most important. Humans have the power to organize in armies and invade other countries as the Assyrians do. And they do it. As is well-known, we have the power to inflict apocalyptic violence with our weapons. Overlong and unnecessarily complicated, Greg Boyd presents a reading of the Old Testament through the lens of the crucified Christ resulting in claims that are times compelling and at other times perplexing. From a rhetorical-structural standpoint, the book could have easily been pared down from its too-massive 1500 pages to a more manageable 500 pages just by a few simple rewrites and removing the majority of the first six chapters. Boyd's proposal, called the Cruciform Hermeneutic, is an intrig Overlong and unnecessarily complicated, Greg Boyd presents a reading of the Old Testament through the lens of the crucified Christ resulting in claims that are times compelling and at other times perplexing. From a rhetorical-structural standpoint, the book could have easily been pared down from its too-massive 1500 pages to a more manageable 500 pages just by a few simple rewrites and removing the majority of the first six chapters. Boyd's proposal, called the Cruciform Hermeneutic, is an intriguing idea: what if we re-read the OT using the epistemology of the Cross as our grounds? It's not necessarily a new ideas - as Boyd points out, Origen attempted something similar; more interestingly, so did Geerhardus Vos - but Boyd provides it with methodological succor that gives the reader hopes on its ability to deliver. Unfortunately, Boyd's precommitments to his more radical theological beliefs (namely, open theism and his unique version of Christus Victor atonement) often shine through more clearly than his interesting hermeneutical strategy, resulting in re-readings of the OT that are more suspicious than they are sound. In particular, his Principle of Divine Withdrawal fits all-too-nicely in a system of thought that would benefit from its claims. His claims regarding spiritual warfare and the kingdom of the devil are the most interesting, in my opinion, and I do think that, from time to time, he opens up an interesting new reading for certain disregarded passages of the OT. But his refusal to allow Yahweh any action he determines is "violent" (a term that Boyd never defines for us) results in a perspective on the Torah that demands much more convolution than exegesis in order to make sense of what is happening. Altogether, the work hovers between the realms of "ooh, that's interesting" and "why are we talking about this?," giving the feel of an incomplete doctoral dissertation rather than a masterwork of ten years' scholarship. There are questions that are begging to be asked and discussed that are ignored or pushed away, while Boyd spends inordinate amounts of time on questions that, honestly, are insignificant for his thesis. The book was largely a disappointment, but, fortunately, I still think that the Cruciform Hermeneutic has value, if it could be harnessed in a way that doesn't require it to submit to the user's presupposed definitions on ideas like "Love," "Violence," and "War." Recently a few people in the United States government said that the Bible teaches you should obey the laws of the land. It is not uncommon for Christians, and others, to point to a Bible verse here or there to justify some act. The problem is, the Bible says a whole lot of things. As Philip Jenkins showed in his book Laying Down the Sword, Christians have used violent texts in the Bible to justify violence. It is a simple part of American history that Christian pastors used the Bible to argue fo Recently a few people in the United States government said that the Bible teaches you should obey the laws of the land. It is not uncommon for Christians, and others, to point to a Bible verse here or there to justify some act. The problem is, the Bible says a whole lot of things. As Philip Jenkins showed in his book Laying Down the Sword, Christians have used violent texts in the Bible to justify violence. It is a simple part of American history that Christian pastors used the Bible to argue for the continuation of slavery (See Mark Noll, The Civil War as a Theological Crisis). The question at the root of any of these debates - immigration, violence - is how do we interpret the Bible? Greg Boyd's book, which we should call his magnum opus, is one long argument to interpret the entire Bible through the lens of Jesus. At first, this does not seem too controversial. When it comes to more spiritual questions, Christians agree that Jesus is the final word. The Old Testament may speak of animal sacrifice or the necessity of circumcision or dietary laws, but we essentially discount that and look to faith alone in Jesus. Jesus, in terms of salvation, is the final and clearest revelation of God. Where Boyd goes with this is perhaps what is controversial, as he argues this ought to be our principle for interpreting all of scripture. The problem, Boyd argues, is that this makes Jesus just one of many pictures of God. If we are going to be Trinitarian though, and even if we are going to follow what the Bible itself teaches about Jesus, we must recognize that Jesus is the clearest picture of God. Jesus is our image of God against which we compare every other picture of God. Boyd brilliantly applies this principle to the violence in the Old Testament. Often when Christian apologists discuss these violent acts, they basically explain it away. One example of this is Paul Copan in his book, Is God a Moral Monster. Books like that one basically say that while God is violent in the Old Testament, the other gods in that culture were worse. God used violence, but not as much. Boyd shows the absurdity of this. Is killing children every right? I found Boyd's argument freeing because rather than having to uncomfortably say "yes, if God says so," Boyd shows how you can say "no, and God never commanded it." Besides, if you say "yes" then, conceivably, in certain situations, you could assume killing in God's name is legitimate. Boyd argues that we compare the Old Testament to Jesus we see that what is actually happening is that God is allowing people to harm him by saying God does things that are awful. If God allowed humans to literally kill him when he became human in Jesus, then why would it be unheard of for God to allow humans to think wrong things about him? But in Jesus, we see who God truly is - God goes to the fullest extent, allowing humans to harm him in myriad ways, to be in relationship with us. Boyd adds to this a number of arguments. God's judgment is not active judgment but simply withdrawing protection and allowing evil to rebound on itself. God allows free will, even to spiritual creatures, and sometimes this free will is used violently. So whether it is ancient Babylon or the sea, these forces are held back by God until God stops holding them back and allowing them to destroy, as they want to. Of course, Boyd is open to the question of whether God allowing something is much better than just doing it. He addresses this, and basically argues for free will. The other option is that God determines everything which, if you are a Calvinist, I suppose makes sense. Really, either side has problems. Either God determines it all, thus God puts the idea in the emperor's head to destroy his enemies or sends the flood to drown people. Or, God who could stop it, allows it to happen. I would, and I suppose Boyd would agree, appeal to some degree of mystery here. We can never know precisely how God works. Honestly, I wish Boyd had emphasized this point a bit more. But I'd rather go with God allowing and not being sure why, then with the ultimate power in the universe destroying people. Plus, if we truly see God most clearly in Jesus, then God, in sorrow, allowing people to destroy and harm makes sense. If you are familiar with Boyd, a lot of his big ideas make it in here. Some, such as Christus Victor theory of atonement and emphasis on spiritual powers of angels and demons, are helpful. The angels and demons stuff was especially challenging to my own modern worldview. His critique of Aquinas and push for Open Theism seemed ill thought out and poorly argued. This is where I wish he had emphasized mystery some more. I don't think you need reject Classical Theism in total to buy into the rest of Boyd's thesis. Overall, this is a brilliant book. It is not hard to read, despite its length. It certainly has contributed to my own thinking. As someone who has long leaned towards nonviolence anyway, but was never entirely sure what to do with the Old Testament, I am more comfortable with putting it up against Jesus. The challenge here is how to explain this to people. A student of mine said his question, and even the question his atheist friends would ask, is that this sounds like you are "discounting the Bible" or you "don't really believe the Bible." I'd say that illustrates how deep the flat reading of the Bible, with Jesus as just essentially a prophet, has filtered into our culture. At the same time, I think this method of interpretation is already where most Christians are with many things (again, we don't sacrifice animals) and, if we truly reckon with Jesus as God in flesh (Trinity) then we rest on our final authority as God and not the Bible. The Bible is not the word of God primarily, instead it points away from itself to Jesus. As someone who has followed Boyd for years, I think he has outdone himself with this last outing. Yes, it is extremely long, owing in part to the comprehensive nature of the case Boyd is making, along with his inclusion of pre-emptive responses to possible critiques. But considering the length and the academic nature of the writing, I found it much easier to read than many other works of this scope. Boyd's pastoral heart pulses through every page, and insofar as he ESSENTIAL THEOLOGICAL READING. As someone who has followed Boyd for years, I think he has outdone himself with this last outing. Yes, it is extremely long, owing in part to the comprehensive nature of the case Boyd is making, along with his inclusion of pre-emptive responses to possible critiques. But considering the length and the academic nature of the writing, I found it much easier to read than many other works of this scope. Boyd's pastoral heart pulses through every page, and insofar as he dearly wants people to grasp what he is doing, he was able to make this relatively accessible piece of serious theological reflection. This all being said, the reader should know that this is both serious theology and philosophy. Boyd is conversant with the various strands of philosophical thought that bear on his perspective, and his overall argument is that much stronger for it. The work is also extensively footnoted and researched, which I appreciate, but could prove to make it more difficult for some readers. I don't think I've ever spent more than a year reading a book before this one. Now technically it is two books (Goodreads where's the love on my Reading Challenge?) but regardless, it is a project to complete. But a worthwhile project nonetheless. For those more familiar with Boyd's mass market books, you will find this one nearly impossibly dense and full of jargon that will be unfamiliar. This is Boyd's self-ascribed magnum opus, the pinnacle, in his mind, of his academic and heremeneutical work I don't think I've ever spent more than a year reading a book before this one. Now technically it is two books (Goodreads where's the love on my Reading Challenge?) but regardless, it is a project to complete. For those more familiar with Boyd's mass market books, you will find this one nearly impossibly dense and full of jargon that will be unfamiliar. This is Boyd's self-ascribed magnum opus, the pinnacle, in his mind, of his academic and heremeneutical work. It is unabashedly academic in style, referencing centuries of Western Christian thought and hundreds of sources. The footnotes, which are voluminous, represent almost a 1/3 of the book, with a wealth of knowledge in them as well. Beyond the structure of the book, the content is critical: Greg provides a historically grounded, theologically defensible view of (1) why and how the cross is the ultimate revelation of the character of God and anywhere God appears (even in Scripture) that doesn't conform to the non-violent suffering servant view of God is a cultural accommodation and (2) how to apply this view to some of the most violent and morally reprehensible passages and themes of the Old Testament. The importance of this work for the future of theology is no small thing. There are many places where I felt Greg's need to confirm to the clunky language of his theses and to tie himself to hermanuetical styles which are not required made the reading unnecessarily hard. But academic writing is, by definition, defensive work, so much of the material written is to preempt his likely critics. This is one of the most impressive works I've read in some time. I'm not sure I agree with everything -- that will take more time, thinking, and reading -- but it's an impressive argument. Much of what I initially felt would hinge on rationalizations turned out to be carefully done exegesis. It is long and there are some repetitious moments (arguably necessary for the sake of completeness), but it's worth the read. There are many big ideas to grapple with here, whether to ultimately embrace or re This is one of the most impressive works I've read in some time. I'm not sure I agree with everything -- that will take more time, thinking, and reading -- but it's an impressive argument. Much of what I initially felt would hinge on rationalizations turned out to be carefully done exegesis. It is long and there are some repetitious moments (arguably necessary for the sake of completeness), but it's worth the read. There are many big ideas to grapple with here, whether to ultimately embrace or reject, and there's hefty scholarship behind it. This is an important book to engage with, but it’s not for the faint of heart or for children in their faith. It’s overwhelmingly anachronistic in its views about "violence" and "evil." Apparently Boyd welcomes (indeed, invites!) Christians to think of sin, evil, hatred, and violence from a blend of 21st century ideologies. Boyd puts on a lengthy display of the Bible's "horrendous violence" coupled with his commitment to view the Bible as "inspired" and "infallible,” although he’s pretty slippery This is an important book to engage with, but it’s not for the faint of heart or for children in their faith. It’s overwhelmingly anachronistic in its views about "violence" and "evil." Apparently Boyd welcomes (indeed, invites!) Christians to think of sin, evil, hatred, and violence from a blend of 21st century ideologies. Boyd puts on a lengthy display of the Bible's "horrendous violence" coupled with his commitment to view the Bible as "inspired" and "infallible,” although he’s pretty slippery about what that means. He is clear about what that does not mean, but not so clear about how his notions tie into orthodox commitments decided long ago by the Church. I suspect that this book will receive much praise over time. I certainly will not be one of them, mainly because his argument comes down to this: God sovereignly allowed and inspired people throughout the Old Testament to portray Himself as he is NOT—that is to say, to portray Himself falsely—so that Jesus could show up and prove how unconditionally loving and non-violent God truly was all along. I think that's nonsense, primarily because the New Testament portrays Jesus and His Apostles as conditionally loving, but also because IF Boyd's methodology is appropriate, then there is no reason why people can't make similar, but inverse commitments to the "violent" character of God revealed throughout the Old Testament. That is to say, in principle, Boyd offers no satisfactory rationale for accepting the "inspired" and "infallible" portrayals of this New Testament "God" he imagines to be "unconditionally loving". People (especially Jesus-hating theologians) could easily adopt Boyd's hermeneutics and claim that the gospels and epistles depict God falsely, and the violent God of the old covenant is the true God. Adding to all this, Boyd spends most of the first volume connecting his own hermeneutics with a wide swath of biblical scholars over the centuries, and especially the church fathers. He fails to offer any consistency between them though. Upon a closer look, his selection of quotations in defense of his hermeneutical approach is decidedly artificial—it does not match with the wide variety of conflicting quotations I have gathered in my own research about Preterism, which clearly illustrate their widespread belief in the conditional love of God and the perfectly holy, just, and wrathful character of God. Boyd also teaches that the impassibility of God is not true, thereby confusing christian dogmas about God's essence. God, according to Boyd, is portrayed as being primarily human, which is the inverse of traditional Christian (and Biblical) stating points about Him. Volume one was too pseudo-Marcion for my tastes as well. I think Boyd could learn a lot by actually studying biblical law outside of the conventional teachings of evangelicalism and rabbinic Judaism. I also think it's a shame that Boyd shows himself to be clearly aware of the destruction of Jerusalem alluded to throughout the gospels, while simultaneously failing to apply that to Jesus' statements about non-violence and persecution. For Boyd, every appearance of negativity and conditional love in the New Testament amounts to a faulty human portrayal of God as he truly is not. He is highly selective. Quoting numerous contemporary scholars in favor of his idealized portrayal doesn't help either. It only muddies the water. On a positive note though, I was glad to see Boyd interpret the New Testament message as being opposed to wicked Jewish authorities in the first century and not promoting anti-semitism in those passages. I also was happy to see him interpret the winepress imagery of Rev 14 as the martyrdom of the Christian saints. That comports with my own view, but also with scholars such as Caird and Leithart. I found Boyd's principles of redemptive withdrawal, cosmic conflict, semi-autonomous power, and divine accommodation truly helpful. I appreciated his attempt to wrestle through the violent portraits of God in the OT and his insistence that we should see Jesus as the climax of God's self-revelation, and that this must essentially be cross-shaped. I discovered several new dimensions to ancient near eastern culture and worldview, which serve to illuminate in several ways the accounts under discussi I found Boyd's principles of redemptive withdrawal, cosmic conflict, semi-autonomous power, and divine accommodation truly helpful. I appreciated his attempt to wrestle through the violent portraits of God in the OT and his insistence that we should see Jesus as the climax of God's self-revelation, and that this must essentially be cross-shaped. I discovered several new dimensions to ancient near eastern culture and worldview, which serve to illuminate in several ways the accounts under discussion. Oddly though, I find the overall argument less compelling than Boyd seems to, at least when it comes to applying it to particular OT passages. This may simply be because I need to apply the principles through my own readings to discover for myself the explanatory force of the argument. However, since we are, it seems, inescapably bound to our own times and inextricably embedded within our own culture, I wonder if perhaps the case Boyd wants to make is simply too "Western." It was truly everything I thought it would be. A brilliant, challenging, work of theology and exegesis that I feel I went to battle with over the course of the summer months of 2017. I can see more clearly that ever before, the beauty of the cross in the Old Testament. While I feel there were far too many typos in the book, they are inconsequential when compared to the enormity of what the book as done for me. Not many theologians get to write a book like this in their career -- a 10-year project written in community with many other theologians and Christians and based on an impressively comprehensive corpus. The length of the two-volume work is definite Boyd exposits the utter centrality of Christ and the cross to all biblical theology, particularly the problem texts of the OT. This is quite simply the best (and the only good) book I have read about the problem of texts such as the Canaanite genocide. The Principle of Cruciform Accommodation: This principle will be the most controversial of the four because it does require an unconventional reading of some texts. Boyd states the principle as follows: "In the process of God 'breathing' the written witness to his covenantal faithfulness, God sometimes displayed his triune, cruciform agape-love by stooping to accommodate his self-revelation to the fallen and culturally conditioned state of his covenant people" (644). Boyd coins the term "literary mask" for what is going on; he argues that at times God is willing in his own revelation to be portrayed as a violent ANE God because the people through whom he was revealing himself were so fallen in their understanding of him. Boyd believes that this representation is a literary parallel to what Christ did in assuming the position of a dangerous criminal being executed on the cross. This principle will be controversial because it means reading some violent passages as not meaning what they explicitly state. Boyd would argue that everything must be interpreted in light of Christ and the cross. The Principle of Redemptive Withdrawal: I find it easier for me to agree with this principle, which states that "God judges sin, defeats evil, and works for the redemption of creation by withdrawing his protective presence, thereby allowing evil to run its self-destructive course and ultimately to self-destruct" (768). The Principle of Cosmic Conflict: This principle is related to a lot of Boyd's work from the 1990s on the invisible conflict between spiritual forces. Boyd expressed the principle this way: "The agents that carry out violence when God withdraws his protective presence to bring about a divine judgment include perpetually-threatening cosmic forces of destruction" (1010). He uses this principle, sometimes in conjunction with others, to explain such violence as the Flood, the destruction of Sodom and Gomorrah, and even the death of Korah and his rebels. The Principle of Semiautonomous Power: Like the first principle, I had never really thought about this possibility; unlike the first principle, I find it much easier to accept that "when God confers divine power on select people, he does not meticulously control how they use it" (1196). The section of the book on this principle I found quite edifying, particularly in Boyd's exposition of how Christ could have at any time disobeyed God and abused the power he had (e.g., by calling on angels to deliver him from Satan, or even by not dying on the cross), but that he never did, in sharp contrast to Moses and the OT prophets. Boyd uses this principle to explain incidents such as a bear mauling 42 young men. The last three principles are much easier to accept, coming from a conservative hermeneutic, than the first principle, and I need to think about the Cruciform Thesis for a long time. Boyd works his Open Theism into the Thesis, and it seems to work fine, but fortunately it is not essential to the Thesis. Much closer to the core of the Thesis is his Christus Victor view of the atonement, for Boyd assumes an Anabaptist, fundamentally nonviolent view of God. If that view of God and the atonement is correct, then he may very well have the key to all violence in the Bible; if it is not, then I still am not entirely sure where that leaves us exegetically, especially in regard to genocide in the OT. The only plausible alternative I see is allegorical interpretation, which of course has its own problems. But regardless of whether he is entirely right or wrong, Boyd has delivered a tour de force that represents the most honest and humble consideration of these hard passages that I have ever read. Theologians and OT scholars will be able to build on his work, and I am grateful to him for reintroducing me in a hopeful way to a set of passages to which I had all but thrown up my hands. 1) The book mainly suffered most from length. While his work is meant to be academic in nature, and that does come with certain expectations of "dialogue partners" and fending off potential objections to his thesis, the Crucifixion of the warrior god could have shaved off most the contents in volume 1 in order to streamline the argumentation and thesis. Or, at least, been almost 2/3 the size that it is. 2) The biggest issue comes through the theme of Gods divine condescension as reveled through the cross. Is the clearest picture of God found in Jesus? Yes. Is the cross the place where Jesus' life and work most evidently point to Gods love/humility/character, etc? Indeed. Cruciformity is humility, and that's the divine trait over-and-against human pride (the root of sin). None of that need be argued about. It's quite a convincing case; the NT seems clear on this, and the church has a long history of understanding Jesus this way. What is less convincing: the need to always understand God's "undoing" of evil and sin through the lens of non-violence (my critique is coming from a worldview that positively embraces Jesus' non-violent human ethic for citizens of the Kingdom). One of the prime examples would be Boyd's conception of account such as the flood; essentially, Boyd argues that the flood is God withdrawing his divine protection from creation enough that demonic forces are responsible for the consequences (because evil is unsustainable, and the forces of evil will only collapse/implode when left unchecked). Yet, it seems like God would still ultimately be responsible despite this line of reasoning, even if he removes himself from the equation somehow (something along the lines of Kants moral imperative and a philosophical "trolley" analogy spring to mind). So, Gods not exactly "off the hook" in a moral way. And Boyd's pitbull analogy--while not a straw-man per se--did not seem to account for necessary details in the problem of evil. But....I'm honestly not sure why, if God is good, His assessment and methodologies in dealing with evil can't be trusted, even if they're "violent" looking. Full disclosure: the only problems I have with violent portraits in scripture stem from human-on-human violence that seem to be assumed as divinely ordained (such as herem passages). Ultimately, I think that Boyd's work actually didn't explore how vastly ahead of its time the OT was. There's something supernatural about its composition when you start to actively investigate how ANE laws, like the lex talionis, are mitigated differently in Israelite Law codes (compared to Hammurabi's codes, etc). Further, bringing in the concept of psychological trauma, the APA defines it as such: "a type of damage to the mind that occurs as a result of a severely distressing event. Trauma is often the result of an overwhelming amount of stress that exceeds one's ability to cope, or integrate the emotions involved with that experience." Now, a trauma-informed worldview actually highlights that trauma is about how we process something (please read THE BODY KEEPS THE SCORE by Van der Kolk on the subject). One thing can be traumatic for someone, and not traumatic for another. Because this is how human brains are wired, it creates space for "violence" to be more circumstantial. I.E...a divine portrait of violence doesn't necessarily "have" to be perceived as traumatic, if it's processed (the action was "just" per se), or healing can still happen (a broken limb can be traumatic on a brain/body, but healing can happen, and the trauma dealt with). I don't see the need to find a "non violent" interpretation of God's character mitigated by the cross in every single "perceived" picture of violence in the OT. The concept of violence may be too abstract to justify a need to do so. But I am more persuaded by a joint Crucifixion-and-resurrection hermeneutic than I am by a sole "cruciform" thesis. My hope is placed on Jesus as the crucified-and-resurrected king, and in God's (re)new(ed) creation. Which brings me to my third and final critique. 3) I am persuaded by a cruciform king and his cruficorm kingdom (cf, chapter one in Michael Gorman's INHABITING THE CRUCIFORM GOD, and Jeremy Treat's THE CRUCIFIED KING). But not for Girardian scapegoat reasons (google "why Giradians exist" for a one-stop shop, devastating, critique of Giradianism), or for a purely non violent atonement theology. PSA, as well as Christus Victor, and all the various other kaleidoscopic facets of atonement theology, are too convincing to eject from a rich understanding of what happened in the cross. Further, the resurrection is where our hope lies—that's even basic to Judaism leading up through the first century. Is the resurrection possible without the cross? I don't think so. But to only have a cruciform thesis, not a co-equal emphasis (or, possibly, greater emphasis) on the resurrection and (re)new(ed) creation as a part of the structure seems like a pretty big misstep for a Christian hermeneutic. According to Paul in 1 Cor 15, more hermeneutic emphasis is given to the implications of Jesus' resurrection beyond His purely having "died according to the scriptures." Rather, He was "buried, and rose again three days later, and then appeared" to a lot of people. And, based upon these resurrection-based experiences, Paul extrapolates the support for Christian experience, baptism, the nature of the resurrected body, etc.. His point has more to do with the implications of the resurrection. Again, to summarize this last critique: I think a better hermeneutic would be a cruciform-and-resurrection one. This is not a short book (given the 2 volumes), but I did find it a worthwhile read. As the Author made known his Anabaptist viewpoint, as well as his strong support of Origen, I wondered how I as a Lutheran Pastor would find this work. First, I think the Author does quite a good and fair job in his dealings with Luther (and Augustine), and I have always had a Christ-centred, and as the Author argues, a Cross-centred view of Scripture - and that this must influence my hermeneutics, especially wh This is not a short book (given the 2 volumes), but I did find it a worthwhile read. As the Author made known his Anabaptist viewpoint, as well as his strong support of Origen, I wondered how I as a Lutheran Pastor would find this work. First, I think the Author does quite a good and fair job in his dealings with Luther (and Augustine), and I have always had a Christ-centred, and as the Author argues, a Cross-centred view of Scripture - and that this must influence my hermeneutics, especially when it comes to the OT. So overall I was pretty much in agreement or at least sympathetic with the Author's arguments and proposals in volume 1. I did feel that he was arguing for more of a Pacifism than I am currently comfortable with. I also feel that he treated Jesus' actions when cleansing the Temple needed more work. The instances of Jesus' harshness (or appearance of harshness) are too easily dismissed / explained giving how crucial these need to be handled for the overall hermeneutic that is being argued to stand. Sadly, I didn't enjoy the 2nd volume as much - which I found strange as I expected to see the implementation of the hermeneutic to turn some of the areas in which I was only sympathetic to more in favour of the Author. Whilst I still agree with many of his arguments and his application, I came to feel as though the Author was pushing the model too far. I think he does a marvellous job of examining the sacrifice of Isaac, for example - but the areas of Theodicy (such as Job), and of natural disaster / judgement (such as the Flood) just feel like "passing the buck". That is, it comes across that God is not "at fault" since he has allowed other people / other forces (with the possibility of heavenly forces controlling nature strongly argued) to carry out these deeds. But to my thinking, if these people / forces cannot do these actions without God allowing it, then it really doesn't matter how reluctant or heart-broken God is, as Sovereign the responsibility is still his. So whilst I agree that God's judgement is often the removal of his protection as the Author argues, I don't see how this makes God "non-violent". I also think the Author has given too much weight to many of the arguments of the New Atheists, and thus comes across as trying to prove the God is non-violent so as to answer them - which I think fails. I did appreciate his examining of works by Paul Copan - an author whom I do enjoy (and similar to the current Author don't fully agree with) - but do think that the Author too easily dismisses some of the arguments (similar to my complaints above about Cleansing of the Temple). 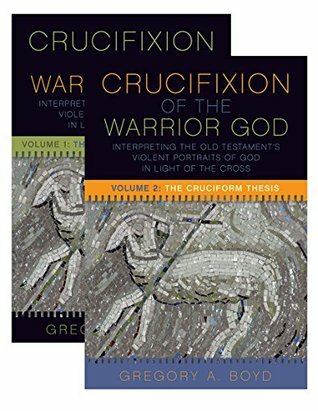 Greg Boyd’s *Crucifixion Of the Warrior God* is nothing short of a tour de force in understanding how the revelation of God through the cruciform nature of Christ is supposed to revolutionise our understandings of the depictions of “divine/divine endorsed” violence within the Old Testament. 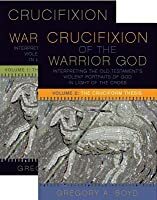 Instead of just moralising these scenes away, or attempting to downplay/dismiss them on basis of historical data, or attempting to synthesise these contrasting portraits of God with what we are shown in Jesus’ Greg Boyd’s *Crucifixion Of the Warrior God* is nothing short of a tour de force in understanding how the revelation of God through the cruciform nature of Christ is supposed to revolutionise our understandings of the depictions of “divine/divine endorsed” violence within the Old Testament. Instead of just moralising these scenes away, or attempting to downplay/dismiss them on basis of historical data, or attempting to synthesise these contrasting portraits of God with what we are shown in Jesus’ life and death, Boyd offers another approach. Following the traditions/trajectories of the early church and the authors of the biblical texts themselves, Boyd suggests that through the lens of the crucifixion (and the cruciform posture that we see exhibited in Jesus’ ministry) we need to look back on these portraits and ask not only what the Cross exposes about the validity of these portraits, but also how does the God-breathed recording of these scenes speak of the Cross: a Cruciform Hermeneutic. Through his artful assessment of the New Testament and early church tradition within volume one, Boyd beautifully lays down the groundwork for his thesis. Concluding that in the same way as we understand the horror and brutality of the crucifixion to be God bearing the sin and violence of humanity, so too do the violent scenes of the OT reflect this sin-bearing nature of God. To use Boyd’s apt description, these texts of horror also perform as “Literary Crosses”. Within his second volume, Boyd then takes this hermeneutic and, by taking a closer look at a vast array of violent episodes within the OT, he discerns how we can perceive this sin-bearing nature of God at work within the narrative. Personally, I think this double-volume work is phenomenal and offers an important paradigm shift to our reading of the scriptures; a thesis that doesn’t deny the God-breathed nature of the text, but that also illuminates our minds to the generational consistency of God’s nonviolent nature. That’s not to say that I agree with everything in this volume, I do have a few minor and major niggles here and there (e.g., although I’d agree with Boyd’s assessment of God’s “wrath”, I would probably go further then him and suggest that even the language of “withdrawal” needs to be assessed as it still assigns ‪‬much culpability to God—and maybe I’d be wrong to do so, based on Boyd’s own refutations to this objection). But I’d still happily identify as being in the Cruciform Hermeneutic school of thought that Boyd has shed light on (in fact, this work has provided some much needed affirmation to a chapter that I’ve written in my next book). Overall, this is a must read—regardless of which side of the fence you sit on. And not only do I foresee this work being pivotal in opening the sluice gates for further developments and adaptations of the the Cruciform Hermeneutic being articulated, but I can also see this work as being one that cannot be ignored by those who are interested in honestly wrestling with the Bible. Thanks for your courage and words, Greg! Love hearing perspectives that match what I am experiencing in my relationship with God and what I see when I look at Christ. I found with books with big words as long as I have my kindle I can just look up the words I don't understand on the spot. Makes it easy. Didn't find it hard to understand and the real person of Holy Spirit is always there to ask questions to. Great book loved it!! This took me forever to finish because the ideas are so profound, so mind-blowing, and so intricate that I need time to process. But it has challenged my view on God’s relationship with Jesus, with us, and with the Israelites. Not sure I agree with all the theories that Boyd brings forth but it truly is an epic work that makes readers think and question what they know. While I’ll admit the end of the first book and the start of the second was a bit lengthy to get through and felt a bit repetitive, it was still a spectacular read. By the end everything suddenly became incredibly compelling and I even got goosebumps at one point. An important and challenging read. This is not an easy read, but Boyd works to answer all of the objections. Thorough and persuasive. More mental gymnastics to justify a chaotic collection of texts. If only the author were more intelligent! I could ramble on about all of my many and varied grievances with this but honestly, the main one is that Boyd reads the OT completely differently from how Jesus does. Jesus insists that if you don’t believe the scriptures and see how the scriptures point to him, you’ve not understood them - i.e. understand the scriptures and you can see Jesus. Boyd insists that we can’t understand the scriptures without first knowing Jesus, and that knowing Jesus helps us to see that the scriptures are inaccurate I could ramble on about all of my many and varied grievances with this but honestly, the main one is that Boyd reads the OT completely differently from how Jesus does. Boyd insists that we can’t understand the scriptures without first knowing Jesus, and that knowing Jesus helps us to see that the scriptures are inaccurate in their portrayal of God. These two volumes are inconsistent, intelectually dishonest, and literally deify the idea of pacifism. Gregory A. Boyd is the founder and senior pastor of Woodland Hills Church in St. Paul, Minn., and founder and president of ReKnew. He was a professor of theology at Bethel College (St. Paul, Minn.) for sixteen years where he continues to serve as an Adjunct Professor. Greg is a graduate of the University of Minnesota (BA), Yale Divinity School (M.Div), and Princeton Theological Seminary (PhD). Gre Gregory A. Boyd is the founder and senior pastor of Woodland Hills Church in St. Paul, Minn., and founder and president of ReKnew. He was a professor of theology at Bethel College (St. Paul, Minn.) for sixteen years where he continues to serve as an Adjunct Professor.